A tragedy in the jeans department and a rip in the ancient fabric of Jermyn Street – The Diesel-Electric Elephant Company. England is back to more usual, civilised temperatures. The past week of the Fahrengezundheits climbing into the nineties (something on the order of thirty-three of the Celsiumoids) – all with humidity levels ordinarily only found in an all-in-wrestling camel’s crotch – were not to the tastes of Hutson minor. Not to his tastes at all. Several cheery souls who wobbled on at length about “how wonderful” the hot spell was have had to be …disappeared, with malice aplenty. The world taking itself a third of the way up towards the temperature of a boiling kettle is not “wonderful”, it’s vile and unpleasant. I have been a grumpy old Hector. A miserable Hector. A Hector on the edge. A Hector just one more “lovely weather, isn’t it?” away from an axe rampage. The nexus nouveau, the mooring du jour, the King It of Where-i-am. Anyhap, the Cardinal and I have mooched on again, taking advantage of early morning coolth and gentle breezes of late. The main water tank is full, the contents of Thunderbirds I, II, III & IV have been sent via the mains pipes to Messrs Parliament & Co., labelled as my considered political commentary, and I am back in a place where, hopefully, my delivery of supermarket comestibles will find me tomorrow. Note to self: take the flare gun, just in case the van misses the turn-off. Sartorially though, this has been a very sad week. My slob-around-anywhere-doing-anything, ancient, favourite, most comfortablest jeans (£7 from Marcus & Spartacus about three years ago, in a sale) have crossed over the rainbow bridge, begun to shuffle off this mortal coil, are in the process of shaking the second of a pair of double-sixes. To wit, they are deceased. The fabric has declared itself no longer able to cover or contain my rippling muscles and they are now more rip than denim. RIP, little denims, I shall miss you. The straw that interfered with the smooth operation of the dromedary’s spine. A chap may tolerate many things, rips from heel to Arsenal Villa, but when a pair of loved jeans finally rips in a place where Messrs The Long Arm of The Law and Miscellaneous Magistrates of the Land may point and shout “FLASHER! – SEND HIM DOWN FOR FIFTY YEARS WITH NO PAROLE!” then it is time for beloved jeans to become floorcloths. Sniffle. Now I shall have to run in a fresh pair, and that takes ages. Just to add torment to tragedy, I snagged and ripped one of my two favourite cool summer-time shirts too yesterday. Rip tides, Rip Torn and Ripped to Shreds. Were he not already sleeping with the fishes somewhere under Westminster Bridge my tailor would be furious. I am bereft. I had two such left, and I had hoped that they would breed, but now there’s just the one. 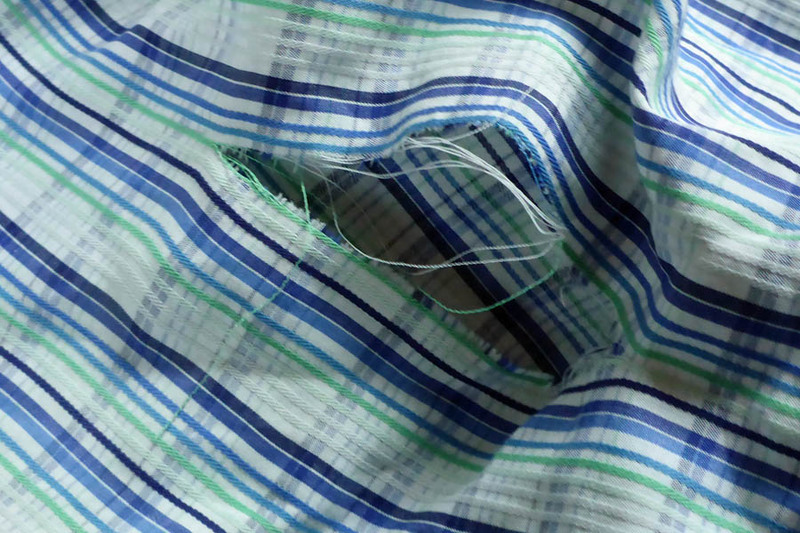 Excess ventilation in what was admittedly a high-mileage shirt, albeit a much-loved one. Still, worse things happen at sea and, were the Cardinal and I to actually be at sea, doubtless worse things would be happenin’. There have been compensations. I accidentally moved to within strolling distance of the Barbridge Inn pub/restaurant and equally accidentally fell through the doors at lunchtime yesterday. Having caused such a commotion it seemed only proper to remain there for lunch, so I did. The wee marina just up the towpath doesn’t know it yet, but tomorrow I shall be lurking like a lurking thing outside their address in order, I hope, to take delivery of a van-load of fresh fruit, salads and other digestibles. I rather neglected the old domestic arrangements this past week or ten days, what was on account, your h’onour, of being inncapacitated due to the extreme yukkiness of the weather and requirin’, as it did, gentlemen of a certain age to sit under dripping wet flannels all day, in the shade. Still, onward and upward, as my old mountaineering instructor used to say as we both looked for ways out of the nursery wing and across the roof towards freedom. Not this week but next I plan on adding a little “oomph” to my “mooch”. This month’s mission statement (remember those?) suggests an exploration of the Llangollen Canal, the welsh one in welshist Wales. The canal with the 126′ high Poncey Sillit (Pontcysyllte) Aqueduct, the aqueduct with no guard-rail on the boat side. I can’t tell you what Pontcysyllte sounds like in Welsh because I have no phlegm, and phlegm is essential if you want to speak the Welsh. The Pontcy-cough-cough-hawk-hawk-gob-schputt-syllte Aqueduct website link. Yes, that’s a narrowboat up there and yes, as you can see, there is not a sniff of a railing. The trough is also made of cast-iron and has been up there in all weathers, getting battered about by all and sundry afloat, for two centuries now. I reserve the right to smell a touch agricultural by the time I’ve piloted the Cardinal over that thing (twice – there and back again). I believe that there are a couple of short tunnels too. Second note to self: get the video camera sorted, j.i.c. That should keep the Cardinal and I amused for a week or two. Does anyone know which side of the canal they drive on in Wales? Will there be border posts? What is the correct procedure upon meeting Y Ddraig Goch? Is it polite to use a fire extinguisher? Do dragons, even Welsh ones, like hot weather? What should I do if Tom Jones starts singing at me from the hillsides? Seriously, the Llangollen is just about one of the busiest tourist canals in t’country, so I may be a little bit preoccupied with the steering and the boating thingery. Somewhere out there though is supposed to be a steam train, a car museum and – mayhap a stroll farther along from my planned point of u-turnery – a house called Plas Newydd. Plas Newydd was home to the “Ladies of Llangollen”, a couple of ladies in comfortable shoes who scandalised society in their day but who also played host to such luminaries as Wordsworth, Sir Walter Scott and the Duke of Wellington. If possible, it seems only proper that I should add myself to the list of visitors to their home. I know that they’d appreciate the concomitant fillip to their visitor book that my signature would bring. So, that’s roughly the plan. Provided that the weather doesn’t turn rotten again (i.e., hot) and that, as non-scientifical types oft say, all other things remain equal, I’ll let you know. there’s a week and a half yet for the best laid mice of plans and men to go awry, etcetera, etcetera. If I get in to Wales will they let me out again? Do we have an embassy there? Damn it all though, with favourite jeans and shirt gone, what shall I wear? You have a helluva way with words, old sock. While it has been raining I have been out for some of the very nice walks that I denied myself for medical and mental health reasons during the recent desert-sun simulations! Most pleasant indeed (except perhaps for today, with the dead badger floating down the canal). I always knew, deep down, that badgers didn’t like hot weather any more than I do, but this one’s reaction seems extreme. Well Sir you have done it again. You must like the sound of my fingers hitting the keys on my keyboard, some of them in the correct order, as I google things you mention. I had never heard of the “ladies” before but love their courage and flair. To do what they did, to defy their families and do their own things, it is almost like they had canal boaters blood in them. I was surprised that the standards of coverage and clothing fitness are not a lot looser on the canal. I am sure there are some that come out of the boat at different times and forget their fellow boaters may have more sensitive states about their mood of dress, or lack of? I am sure there is not a dress inspection of older boaters making sure younger women are in the proper “sunning while floating” attire. As for dragons my knowledge is limited to just my ex lovers and and in laws, but I would think if you have fire on going in the belly, it may not bother you if it is warmer than should be outside. I can empathise with you on the in-laws! All of the ex-in-laws have hated my guts! I did once walk past a boat just as a very, very grumpy woman stepped off in her nylon nightie and dressing gown to empty her tea-pot dregs into the hedgerow… I managed to not scream or jump out of my skin, and she just growled like a bear with a sore head and ignored me. It was for the best, I think. The wellington boots set off her ensemble nicely. May not be commenting much but sure am laughing a lot. Well you have had a ripping time; the fabric on that shirt looks almost brand new if it wasn’t for the rip! You best save the jeans for the journey over the aqueduct then you can throw them away after! Now if there are two things I’m nervous about its heights and water – gently does it! I too have a couple of problems, in that I can’t swim – and I can’t fly! Well, I can fly, but only downwards and never twice in the same lifetime… The aqueduct is just about at the farthest reach of the planned trip, just before I have to turn the boat around (it’s too shallow beyond for the Cardinal). Lots of lead-in time, but also lots of wind-down time on the way back! To each his own weather. It’s a balmy 91F where I live, humidity about 90%. We’re having a veritable cold wave this year, as it will be hovering between 86 and 90 all week. :-).